After several months of discussion and work in new tweaks for the mod, we have a more or less stable build to share with you! Of course, there are still parts that need more fine tunning and it might change a bit for the Steam release, but the base shall remain like we present it in the next paragraphs. We still plan to release Eastern Front before 2017, that hasn't changed, so the next weeks will be very important for us. First of all, we think is necessary to explain further about our past stance about not having enough material to share in the form of an announcement, and that's because we were in the middle of a huge discussion about the feedback we got from our factions, what makes Soviets good to play, which problems they have due to how we assemble their tech tree, are the command trees fun and balanced? And we question the same thing about Ostheer. Our development cycle is quite long unlike other mods because we are always trying to improve a lot of the game mechanics which makes us appear like we take an eternity to release new stuff. Also, right now Burton, from the ZombieMod project for Company of Heroes is lending us a hand with the animations of some of the models we need for the Steam version. You will see more of that in the future. 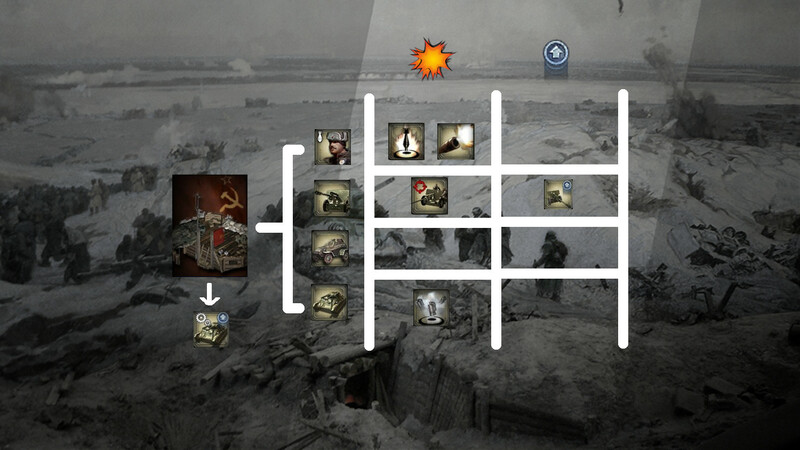 So, this announcement will cover the normal tech tree used by Soviets, other announcement will cover it's command trees, but they won't necessarily come in that order, in example: if we find better to post the Ostheer Tech Tree before the Soviet Command Tree then it will be done. We have prepared some simple illustrations to depict how the tech tree looks at the moment and what skills have each unit as well. The HQ can produce two units: Ingenery squads and the ZiS-44 medic truck. Both haven't changed too much and keep their same abilities and upgrades. This building is the first one you can build and allows Conscripts to be recruited, however, they are called as reinforcements from the off-map area; Strelky, Command Squad, Observer Team, Sniper and Heavy MG Team units are recruited and come from the building as usual. 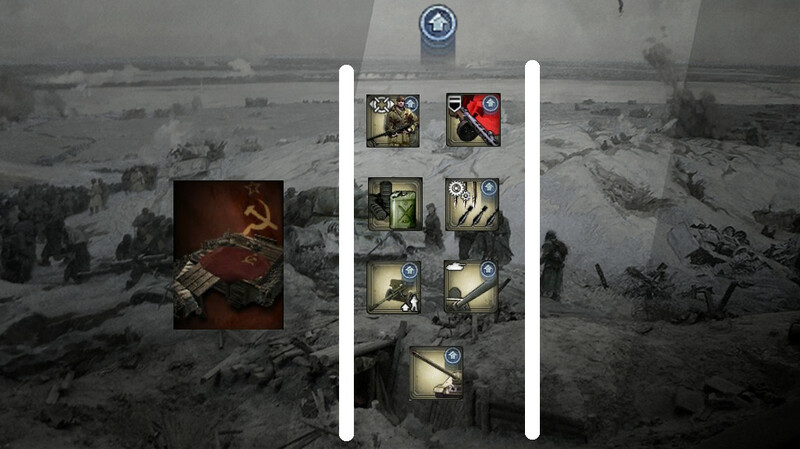 Conscripts and Strelky share the same defensive structures to build and also both have molotov cocktails as primary anti-personal device, while Conscripts have a rifle grenade to act as softcounter against armoured units and Strelky can purchase PTRS anti-tank rifles against enemy armoured support. When Strelky are upgraded to their Red Banner version, the leader gets promoted into an officer as well. 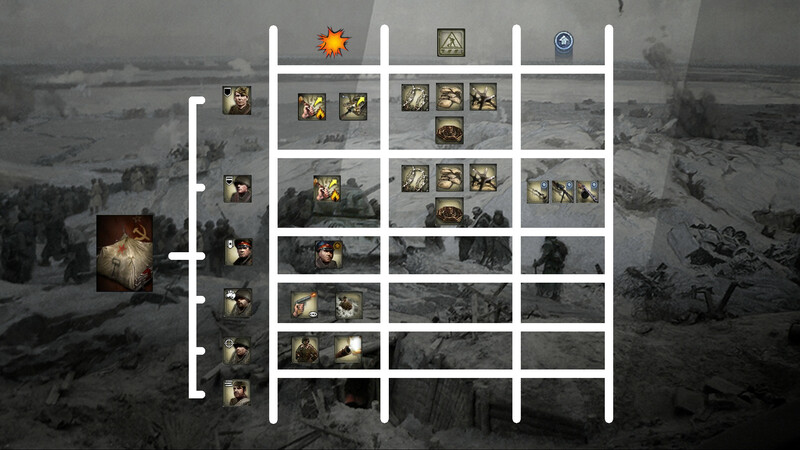 The Command Squad remains as a four men squad, however, it only has one active ability that is called "Strafniki Demotion", which targets Strelky and Conscripts squads: once you select one it will be converted into a Shtrafniki Squad (aka Penal Squad), with better stats and weapons but will no longer earn veterancy. The Observer team is shifted more into a infantry - jeep type unit: it gets additional sight range in cover, has reduced chance to be hit by snipers and deals bonus damage against htem. The flare detects cloaked units and gives nearby enemy units a +25% received accuracy debuff. The Sniper... well it snipes units . The Heavy MG Team remains as usual, with some stats tweaked. 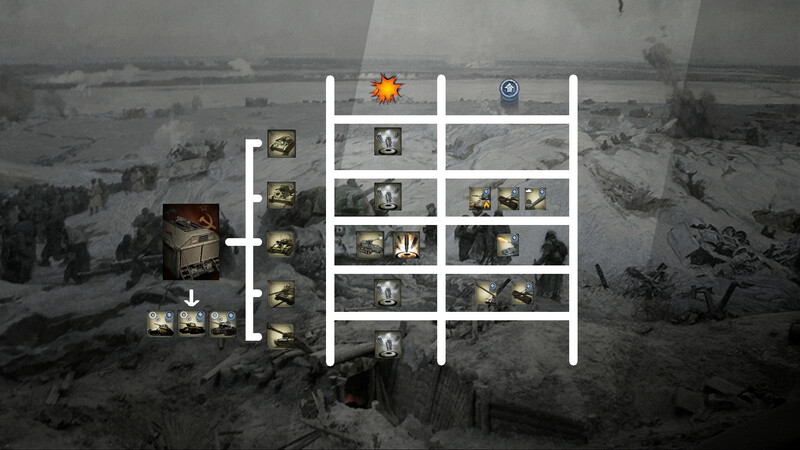 It allows to recruit the 82mm Mortar, but Heavy mortar squads can still be recruited later too and the ZiS-3 gun is also there with only stat changes; however, there are two new additions: the BA-64 and the T-70 light tank, the latter being unlocked after purchasing an upgrade from this very building. Our BA-64 will act like a true armoured car and not like a Jeep, so don't expect some rifles will kill it too easy . We still need to create a new building for this one, hopefully we will replace it very soon. Now for the vehicles it allows to create: T-60, T-34/76 (later T-34/85), SU-85 (later SU-100), SU-76 and IS-2. The T-60 no longer requires any upgrade, thus is available by default. SU-76 requires Light Tankovy research to be unlocked. SU-85 requires Heavy Tankovy research to be unlocked. T-34/76 requires either Light Tankovy or Heavy Tankovy research to be unlocked. IS-2 requires a new upgrade named Breakthrough Tankovy to be unlocked, but it requires Light and Heavy Tankovy to be researched. Men Against Tannks: Improve Strelky and Conscripts against armoured units. Red Banner Strelky: Improves the combat strenght for the Strelky squads. 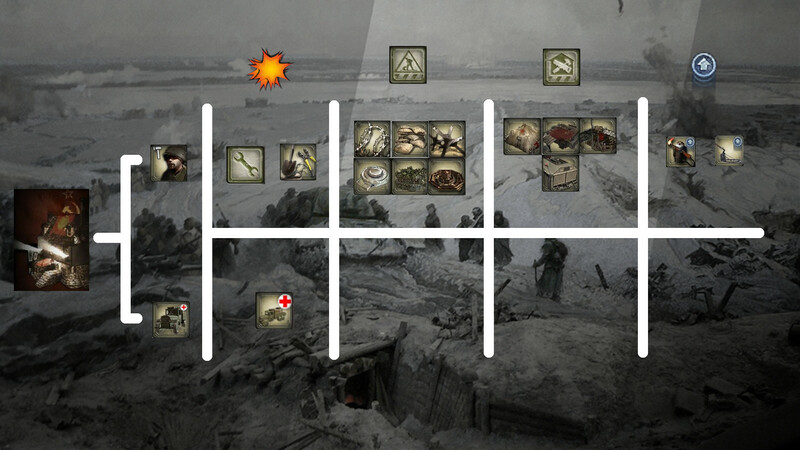 Additional Reserves: Lowers upkeep for Soviet units and also lowers the research time for weapon upgrades. Ballistic Veterans: Replaces the production of 82mm mortar with the 107mm one. Improved ammunition: SU-76, ZiS-2 and ZiS-3 receive better anti-tank shells. 85mm Gun Upgrade: Replaces the production of T-34/76 units for T-34/85. T-34/76 units in the field must be upgraded individually. 100mm Gun Upgrade: Replaces the production of SU-85 units for SU-100. SU-85 units in the field must be upgraded individually. We are still planning about what to do with the eight upgrade. This might change slightly later, but there shouldn't be any huge or dramatic departures from this layout, we will be working in the next announcement to release it soon as well, so for now I hope you have enjoyed the update, and if you have a comment about it don't hesitate to share it in the comment section. Is the Weapon Reserves upgrade finally gone? To be honest I won't miss it if that is indeed the case. It always felt very cheesy. I understand that vCoH took inspiration from Band of Brothers et al, but Enemy at the Gates is much more ahistorical and clichéd (at no moment did the Soviets have shortage of weapons, in fact in Stalingrad they had shortages of manpower at some points). I'd very much prefer to have an upgrade to increase squad size, a la Panzer Elite (maybe called Extensive Conscription/Far East Reinforcements), or have incremental squad size tied to veterancy. Still, I trust in your judgement since everything else so far looks terrific. Can't wait for the next update! Well, I'm not sure what upgrade will be added of if Weapon Reserves would be added back to be honest. Depends of what the balance team feedback says . By the way, where is a ZiS-6 truck? Will you add its? Other than using it as campaign unit, I don't think we can find a suitable way to use it in EF. Good job guys! Keep up the good work! Will content for the single player component? When?